It is estimated that on Easter Sunday, 33 million Americans will choose to dine out at a restaurant. Of those, over half will choose a restaurant with a buffet. Is your restaurant’s buffet working at its most efficient to support the holiday business? As the Easter holiday comes and goes, you need to make sure your buffet is working at it’s best. A buffet that is not functioning properly could cost you in not just emergency repair costs, but in customers not coming back to your restaurant. By troubleshooting problems with your buffet well before the holiday rush, you can make sure your customers leave happy, satisfied, and excited to come back to your restaurant. Leaks in the steam trays, causing hot water to splash and pool. CPS is here to help you ensure that your buffet is in top shape so that your restaurant can capitalize on the full potential of your buffet table – both during and after the holidays. 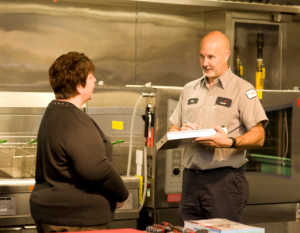 Our technicians can come to your restaurant and evaluate the buffet to see what needs to be done in order for it to function at full capacity. We service all the top brands, including Daslos, Hatco, Duke, Garland, and more! We have 45 CFESA certified technicians with years of experience, including an average of 2 years manufacturer training so that they can best assist our customers. On average, we are able to solve 85% of problems on our first visit. We offer reliable restaurant equipment service and technical support to give you peace of mind, especially during busy times. Don’t lay an egg this Easter season – make sure you get the best for your buffet, and serve your customers the high quality they expect from you. Contact us today to let us help you get your buffet ready! Ask a Tech: What If My Commercial Range Hood is Broken?